A Blaze of Feather’s EP 1 feels like overcast, like Irish winter, like the wind. A cloud of mystery surrounds this experimental dark-folk project lead by Mickey Smith. Information about the band still remains quite sparse, and only recently did Smith reveal himself as one of the main producers and members, while also confirming the involvement of indie-rock’s big name Ben Howard (Every Kingdom, I Forget Where We Were) in the project. Instrumentally, the sounds of the electric guitars drenched in various reverb, delay, and octave generator effects are the most striking element of the EP – consistently and definitively pushing the limits of a guitar’s imagined potential. Their presence is so all-encompassing and elongated, I often confused them with the synths also at work in most of the songs. A shimmering acoustic guitar also appears in a few of the tracks on the EP, and creates an interesting contrast when paired alongside the immense atmosphere created by the synths and electric guitars. Th EP’s single, “Carousel,” showcases this contrast best through its excellent arrangement of verb-ed out guitars and droning synths in combination with a strummed acoustic guitar that pops in and out of the mix. Like almost every track on the EP, the ambient sounds fade into the left side and dynamically drip into the right, forming a strong stereo soundscape for the vocals to complete the melodic sphere. Howard is featured in this track, where he sings, “With my last breath / I comfort you,” right before light sawing synths reclaim the musical arrangement for a few bars. A steady rock beat is then re-introduced alongside them, and drives the song until its end. Ultimately I found the standout track on EP 1 to be “Death.” It begins like the others on the EP, with a long, droning intro. At the one-minute mark, layers of voices suddenly appear, and their blend is so full that they sound like a synths themselves. This makeshift synth-choir ends with the most powerful line of the EP: “There is no shelter from the sound of the end.” The track then converges into a Schoenberg-esque string accompaniment with octave jumps and tones that interchange between being melodic and dissonant. This instrumentation suggestively (and intentionally, I believe) creates what “the end” may sound like: a composition of isolated yet serene tones that mesh together to construct an uncertain but grand and distinct whole. Each song on A Blaze of Feather’s EP 1 is a mini soft-world, like a separate cloud of sound in a wider atmospheric space that contains the six songs of the release. The low-volume distortion that carries over into every song connects each piece as if they were overlapping like smoke. 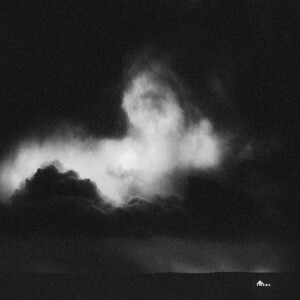 Perhaps this is what the album attempts to capture in its cover: a giant cloud of music that characterizes white and dark and gray weather through poetry and melody. This entry was posted in Reviews and tagged a blaze of feather, francesca pastore on May 19, 2017 by CKUT Music Coordinator.